Last year, I led ceremonies in a wide array of stunning venues, (one of the joys of being a celebrant)! To catch up on Part 1 click here. England has some stunning, historical manor houses set in delightful country estates, which are beautiful and popular wedding venues. However, they all tend to be licensed for a registrar. So its just amazing when a couple think outside the box and want a personal, unique and memorable ceremony, instead of a standard script and ask me to be their celebrant. 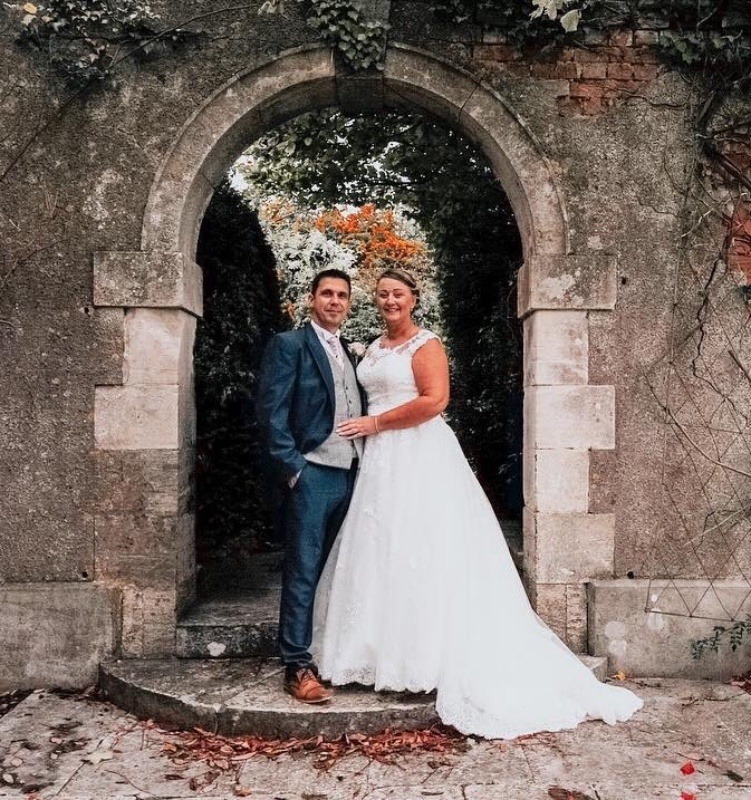 This Autumn, Suzie and Si held their wedding at the beautiful Holbrook Manor, whilst Gemma and Will chose the Orangery at St Audries Park. There are many advantages in using a dedicated wedding venue. They are beautiful, stately and grand, you feel like royalty for the day and it’s a wonderful experience for your guests. They usually come with an experienced wedding planner who ensures your day runs smoothly. Everything is set up for you and cleared away when you have gone, which leaves you free to enjoy the days leading up to your wedding, the days after and most importantly the day itself. 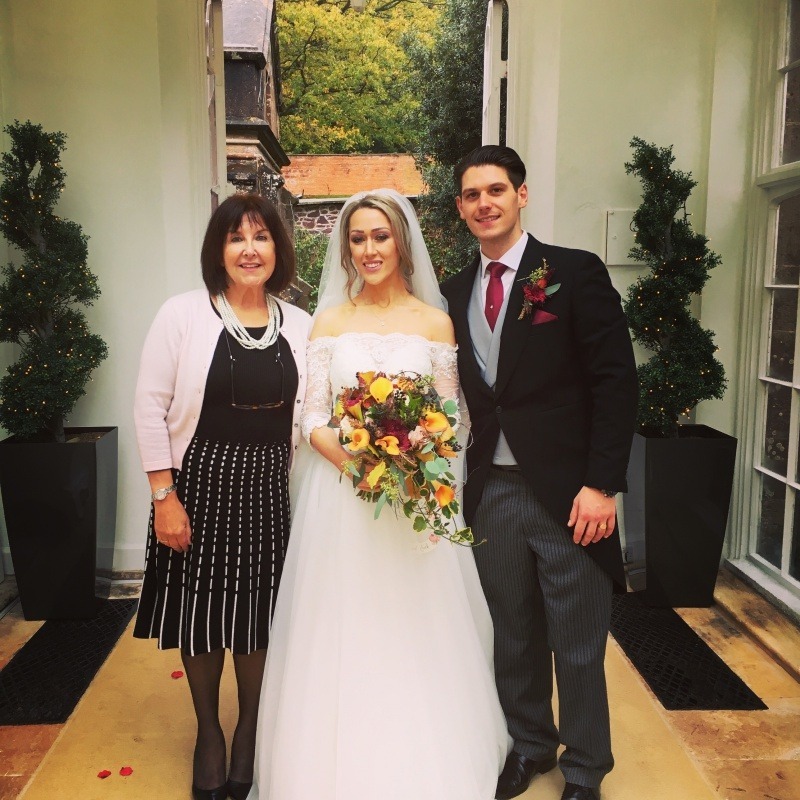 Another advantage of a manor house or stately home is that they are beautiful all the year around, and they looked particularly stunning for these two late Autumn weddings. For, Holbrook Manor and St Audries Park both have long, sweeping drives, majestically tall trees, and creeper-bedecked walls. Guests are treated to nature’s magnificent display of vibrant reds, golds and oranges, as the changing leaves create a magnificent burst of colour, before the onset of winter. Choosing a celebrant for your country house wedding ceremony, means that you are not restricted to holding your ceremony in a certain room. Therefore, like Ali and and Hayley and their Maunsel House wedding, you can even hold your ceremony under a beautiful tree in the gardens. Large stately homes and manors are often purely designated wedding venues and therefore may hold seven weddings a week. Despite having pretty tight check in and check out times, they run a smooth operation and you don’t feel like part of a production line. Venue visits and rehearsals have to be slotted into a tight diary and can be too far ahead of the wedding and difficult for some people to attend. Perhaps the greatest advantages of holding your wedding in a venue like this is that couples are free to enjoy their day, knowing that all the hard work is being done for them by a team of trained professionals and a beautiful, historic, country manor is yours for the day – if only you could stay a bit longer !! the slow hard jewel of trust, the sapphire of fidelity. Last summer was hot! hot! hot! And the British countryside came into its own ! Although all my couples had the safety net of an indoor contingency plan, the good news was, that, because of the warmth and sunshine, none of them needed it. Many outdoor venues come with enough land to set up a tipi or marquee and can accommodate guests really cheaply if they enjoy camping, caravaning and the great outdoors. And weddings can last the whole weekend ! I learned a while ago, with my own daughter’s wedding, to trust the vision and imagination of my couples, and love how they can transform an isolated field or a gap in the woods, into the most amazing ceremony space. Nature is beautiful, and often, less is more. 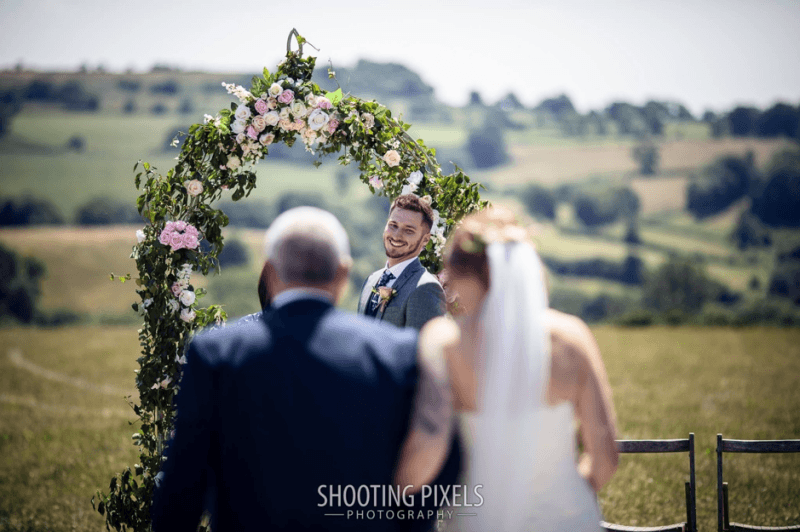 Ellie and Chris, choose their venue, Penny Square Barn, a rustic old stone barn, nestled in the rolling hills of Batcombe Vale, because it was beautiful, blank canvas on which they could stamp their own quirky and individual style. It was a scorching hot day when I met them at the barn, the day before their wedding, to run through the ceremony. Chris was driving the very heavy haybales down to the ceremony space and lugging them into position. Ellie was battling with the enormous roll of hessian that needed to be positioned down the aisle. Dressing a venue is hard, physical work, but great fun, especially it you have plenty of friends and family to delegate the jobs to. Sasha and Ross shared their wedding date with Harry and Megan. 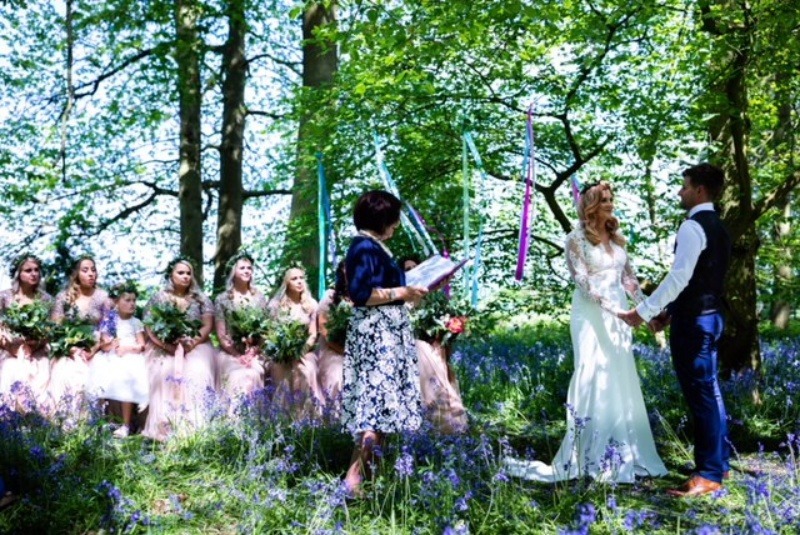 Knee deep in a beautiful carpet of bluebells, a few dangly ribbons hanging from the tree we stood under, and some well-placed benches, was all the ceremony space needed to make it picture perfect. 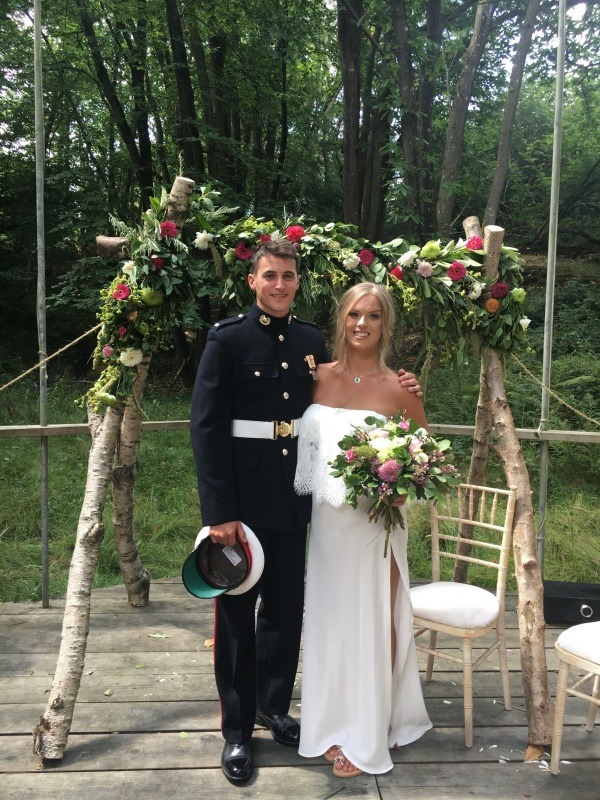 Katie and Matt’s ceremony was held on a wooden wedding platform in the centre of wildwood, under a rustic arch, beautifully decorated with lots of greenery and brightly coloured Zinnias. Outdoor weddings are really great fun, but they are a lot of hard work to organise and prepare. They usually take quite a few friends and family several days to set up. And then there’s the task of packing it all up and clearing away afterwards. Venues differ vastly in the levels of services and facilities they provide and many have strict times for turning down the music and the noise levels. Successful outdoor weddings are weather dependant. Instead of washout weddings, this summer saw elderly relatives fainting in the heat and burning in the sun, through lack of shade. Horseflies and other buzzing, biting things were also out in force. So remember suncream, sunglasses, water and insect repellant as well as wellies, waterproofs and umbrellas. Outdoor weddings are great fun, but take a lot of organising. Many of these venues are off the beaten track, and so if your venue has space for camping, your guests can have the most amazing wed-fest weekend, partying and whatnot until the daylight hours ! There are lots of small companies that cater for these weddings and so the food choices are endless. I’ve seen quirky food bars and horse boxes, tuk tuk rickshaws, fish and chip vans, and mobile wood ovens all catering for a wide array of tastes. Oh and I’ve seen some very posh mobile showers and toilets! For my six top tips for writing your own wedding vows – click here !! For my six top tips for reading your wedding vows – click here ! !